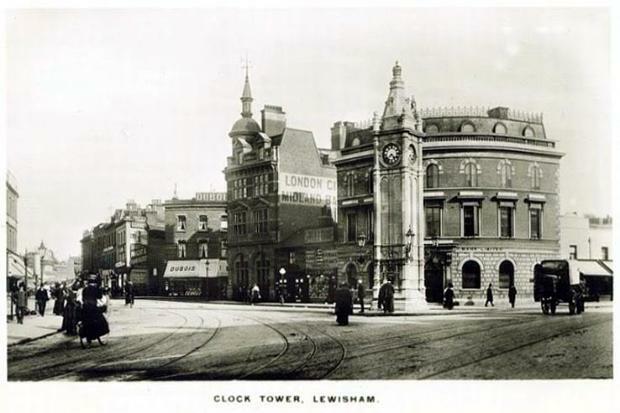 Although not quite as iconic as London's other world-famous clock tower, Lewisham Clock Tower is nevertheless a historical landmark of Lewisham and as such has played a key role in the development of Lewisham over the years. It is easy to pass by this local landmark without giving it much of a thought, or considering it as much more than one of the many bus stops in the centre of Lewisham, or a meeting point with friends before setting off for the day. It may seem somewhat out of place on the edge of bustling Lewisham market, flanked by a high street bank, a pop-up German Sausage food outlet, and the art deco tower house of the former Royal Arsenal Co-operative Society department store (in itself an interesting building with a façade dotted with trains and lorries). However, the tower has proudly stood its ground for over a century since being completed in 1900 to commemorate Queen Victoria's diamond jubilee of 1897. If you have ever looked up you will have seen a dainty tower featuring four clock faces topped with a spire and most notably a crown – a nod to the tower’s royal connection - this is the key feature of this Grade II listed building. The tower is made of Portland stone, historically used across London on buildings such as St Paul's Cathedral and Buckingham Palace, and is designed as a three-stage tower and spire, featuring the aforementioned royal crown. The plaque on the north face of the tower features an inscription VR & I which stands for Victoria Royal and Imperatix (Empress). On the back of the tower there is a small intriguing door which would have been used to access the mechanics to wind the clock. You can find out more about the history of the tower from the plaque that states that ‘the cost was met by public subscription supplemented by a grant of £500 from a fund bequeathed to the parish by Michael Thomas Whitehall of Catford’ – which can only be presumed as a standard bequeathment from a local, which was common at the time, as there is no information on this gentleman available online. It also states that the architect was A. R. Gough and the builders, S. J. Jerrard and Sons. Jerrard was hailed as one of the leading developers across the Lewisham area in the late 1800s, famed for creating distinctive housing around Ladywell(notably in Vicars Hill, Algernon Road, Algiers Road, Ermine and Embleton Road) that offered fantastic new views towards Lewisham and further afield. The tower was erected at a time when Lewisham High Street was developing into a destination for shopping - the area having been transformed from a rural village on the outskirts of London by the rail connection to London that opened in 1849 on the North Kent to Dartford line. (So Lewisham has always had good transport links it seems!) The tower became the focal point of the area just before Lewisham Street Market was established in 1906, signaling the flourishing commercial activity of the area that was about to take place and the general expansion of the Greater London area. The clock tower even survived World War II bombings in 1944, when a lot of the centre of Lewisham was devastated. In all its years it has only moved slightly from its original location - in 1995 when the High Street and surrounding roads were redeveloped in a bid to make the area more accessible. 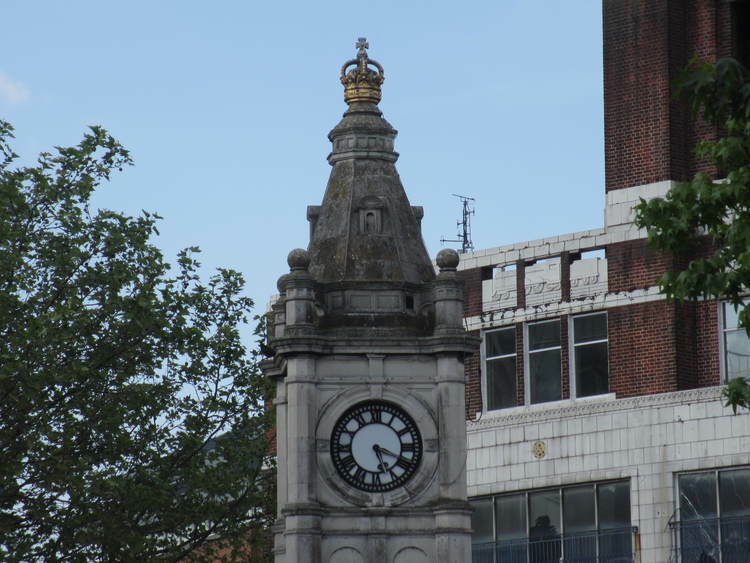 Of all the landmarks in Lewisham, the Clock tower is probably the most known yet least known about. With more than a century behind it, it is certainly one of the oldest. So the next time you’re picking up your fruit and veg or passing by on the bus, have a look at the quietly observant tower and imagine how much it must have seen. Older PostBest of Halloween in South London: What’s on, where, and when.